Not everyone who’s in a rut realizes they’re in one. They just sense something isn’t right. And many people who know they’re in a rut don’t know how to climb out of it. Regardless of which situation someone finds themselves in, it’s important they make changes to ensure their long-term health and happiness at home, at work, and in life overall. We’ll look at signs you could be in a rut and offer suggestions for getting out and getting back in the groove. Everyone daydreams now and then. But if you’re always wishing you were somewhere else, you may be in a rut. The surprise and novelty of doing something spontaneous fills our brains with the motivation neurotransmitter, dopamine, which makes us feel excited, curious and adventurous. Spontaneity also gives us a feeling of autonomy, and that sense of control can boost motivation, too. If you regularly feel like you don’t have anything to look forward to, start to look for beauty in what lies around you. Instead of waiting for something monumental to happen, keep an eye out for the little things that life has to offer. These can make a big difference. It’s not uncommon to feel stuck in the hamster wheel, especially at work. Our brains are wired to resist change, preferring to fall back on old habits. But visualizing our goals and choosing new strategies to achieve them creates new neural pathways in our brains. The more we use them, the stronger the pathways become and the more we can get beyond what’s familiar, safe and often stifling. In the age of social media and curated photo collections, it’s easy to compare your life to others’. But it’s important to shift your focus back to you. That could mean repeating a positive, empowering phrase about yourself, eating healthier meals or even pampering yourself just because. If you feel little sense of accomplishment no matter how much you do, the issue may be that you’re always aiming for perfection. To combat this, silence your internal critic and be happy just getting things done. You’ll feel productive and better about not being so hard on yourself. And remember, there’s always another day or project on which to improve. You’re feeling spent and uninspired, and you can’t shake the feeling. Or can you? By setting aside an hour or two a week to devote to a passion project, you’ll be able to channel your energy into something you want to do versus something you need to do. It’s a true expression of yourself and can reignite your zest for life by giving you a refreshed or new perspective. It’s time to take a withdrawal from your memory bank. Think of something you did in the past that got you excited, and picture yourself doing it. It can even be something from your youth. Once you pinpoint that activity, go do it. This method for getting out of your rut is called the flip technique, and it helps turn your discontentment into something that makes you feel happy again. It’s one thing to be a homebody, but it’s quite another to never go out. Try examining your work-life balance, which can help you determine whether at least one of these aspects of your life is vibrant. Ask yourself whether you’re engaging in the same activities over and over. See what’s on your schedule, and make sure you have new opportunities to look forward to. When you find yourself believing you can’t do something, dig deeper to find out what’s really stopping you. Is it fear? A past experience? Lack of confidence? By looking within, you’ll become conscious of that limiting belief – the first step toward getting past it. Try journaling about daily thoughts and experiences to figure out what’s really going on. Helping others is admirable, but constantly putting their needs ahead of your own isn’t. It’s an unhealthy pattern you need to break. Make a list of the things that make you feel like a martyr or, worse, a victim. Recognize your role in each situation, then brainstorm ways to change them. Check them off the list as you do. This way, you’re taking control of the situation rather than letting it control you. If “What’s the point?” dominates your inner dialogue, try getting outside more often. Research shows that exposure to our natural settings changes the brain to reduce anxiety and thwart depression. Brain activity in the areas associated with critical thinking diminishes, and nature helps turn off our physiological stress response to put us in a more restful state. 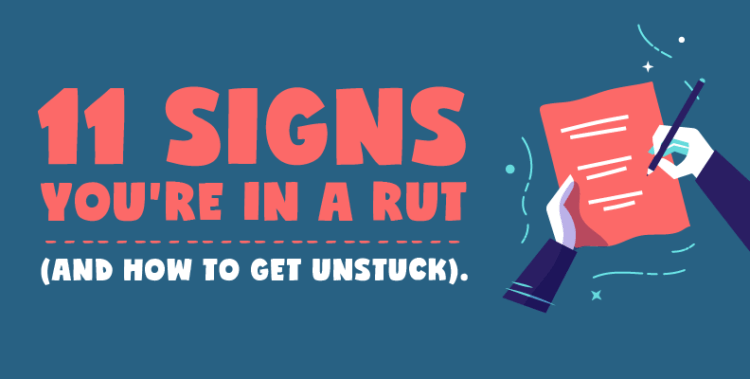 While being in a rut is never fun, implementing a few of these tips can help get you back on track. Keep them in your arsenal, and whenever you’re feeling stuck you can pull them out for an instant boost.